So I'm sure everyone has heard by now that Joe and I are expecting. My due date is Feb 15, which should be interesting because Blake was born on Feb 17. Also, my cousin Vanessa is due around Feb 2. So Feb is going to be on crazy month for us. But should definitely be full of excitement. 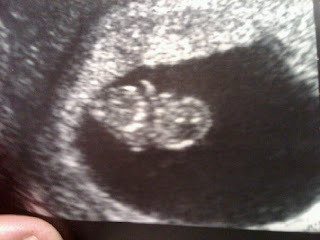 Any who, here is a picture from our first ultrasound. The baby is so tiny! No hands or anything yet, just little nubblys. It's so cute! :) We are so excited. It was so cute watching Joe's face light up into a HUGE smile when the baby came on the screen. I will always remember that moment. One of the best! WOW! What a good shot. So has the reality of it hit yet?